You have found a complete formula that will guide you and your group to create a powerful culture for collaboration. This is about a kind of success that cannot be achieved through standard management and leadership models. In just a few weeks you will know exactly what you can do to guarantee that your team, your entire organization and everyone you collaborate with are working together effortlessly and effectively. Everyone is engaged and inspired as they work together and achieve a quantum leap in your goals and create truly extraordinary success. No more struggling to get people to pull together. No more hiding and withdrawing silently into silos. No more frustrating meetings, wasted time, or mediocre results. Say good-bye to stress. You believe that more is possible but not sure how to get there. You want to get great results and enjoy your work more. You’re fed up with drama, tension, divisions, backbiting, politics, and tedious relationships that make work deadening. You need to create a new partnership or coalition but aren’t sure how to do that so that everyone is aligned and committed to support each other quickly. You suspect that a top-down management structure doesn’t draw out the best possible results but aren’t sure what leadership looks like if it’s not that kind of management. You’re sick and tired of meetings that make you sick and tired! If any of this rings true, then you’ll receive tremendous value from the insight and strategies that I’d like to share with you. You’re invited to the first and only leadership training program based on true collaboration designed for leaders and entrepreneurs by a leader and entrepreneur who know that old styles of management cannot create the results and impact you want. Join us for The Leadership for Alchemy Online Course and Create an Authentic Culture of Collaboration that Maximizes Your Results, Profits and Impact. where everyone is inspired to take 100% responsibility for results. And you will have the structure in place with the flexibility to adapt to change and constantly improve your collective performance. You will achieve more of the results you dream of and enjoy your work more than you thought possible. In this course, I share the fruits of my twenty-plus years of cross-cultural research and organization development practice and show you my proven formula for creating a culture in your group that keeps communication open, efficiency and ease of working together. how challenging it can be to get a group of people to work optimally together. how the company environment can put serious brakes on what you and your team are able to accomplish individually and collectively. I’ve spent the last twenty years studying culture as an anthropologist and working as an organizational consultant to help groups alchemize their talents and improve their results. I’ve discovered what really works – to get things done and create positive learning environments for everyone involved. And I’m on a mission to end the suffering – the frustrations and limitations to what is possible. What I’ve learned is that the highest kind of extraordinary success that a group of talented committed people can create – the gold, if you will – comes from six distinct habits that that people do together – in the group. These are what make the difference between muddling along and creating something truly extraordinary. When I realized how these habits create a culture that makes powerful collaboration easy and reliable, I knew that I had discovered the secret formula to certain success. I’ve compiled these into the only complete, straightforward and easy to apply method called the Formula for Group Alchemy®. This is especially good news for professional partners, executive leaders, social entrepreneurs and small business owners because you know that old ideas of top-down management actually stifle initiative and enthusiasm. You need an alternative model for leadership. Well, it’s here. is the ONLY training available that walks you through a step-by-step formula for authentically creating an intentional culture that will take you from working as an ordinary group to the kind of extraordinary team with the kind of collaboration that creates gold. Develop leadership skills that allow you to invite anyone you work with to join you in collaboration. Teach others how to move to high-end collaboration. Solidly unite and inspire your team (or partners) around vision and goals. Establish and maintain clarity and efficiency through strong agreements. Spark confidence and initiative with true accountability in place of blame. Develop full ownership for the success of the group so that everyone takes total responsibility. Continually inspire quality performance through learning and innovating. Renew what’s working and navigate change with ease. Master the art of growing success. Create a workplace that you love. Have the confidence that comes with knowing that no matter what happens, you have the skills and habits in place to use it for achieving your goals. Let me walk you through how you’re going to get all of this invaluable information. First off, you’re going to learn EVERYTHING you would if you were attending my live group trainings. 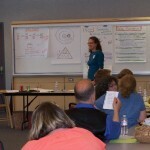 This is a complete version of my 3-day intensive training where I teach how to set the structure for collaboration. I will personally walk you through it! I don’t believe in just sending you a product to have it sit, unused and gathering dust, on your shelf. I’ve created an entire home study course around this life-changing information so you can get the most out of it. Yes, I want this! I’m ready to Register Now! Together we will go through each of the six essential elements of highly successful collaboration so you can take those skills into any work relationship you are involved in. Create practical ways to keep everyone inspired to do their best work – and more. Quickly established a shared commitment to quality and results – whether it’s a short-term association or project, or an ongoing work relationship. Create your vision, mission and goals so they inspire and motivate everyone to do what works to get the results you declare you are committed to. Put an end to solo maneuvering and sinking into “getting by,” or worse, cynicism. Create strong agreements that are clear and that create efficiency because everyone is working in coordination rather than going solo. Uncover the hidden agreements that cause frustration and block success. Practice powerful ways to request agreements when ended so that everyone is operating from the same ground rules. When you learn how to build on responsibility and learning and eliminate blame, then accountability becomes natural.This may be the heart of the transformation in your group. Now that you know how inspiration and agreements work, you can set up true accountability that fuels confidence and initiative. Learn how to get rid of blame and focus on learning. Distinguish responsibility from accountability to restore them to their proper roles. Create true accountability that supports learning and makes accountability desirable. The difference between compliments, flattery and acknowledgment. How to practice acknowledgment that is specific and personal. Promote excellence with reward systems that reinforce mission and goals. Here I’ll show you how to take advantage of natural cultural processes to keep recreating success. Identify the various formal and informal habits in your group that currently renew your culture and determine whether or not they serve your goals. Identify the appropriate roles for assessment, evaluation, planning and special events for your group’s renewal. Create an action plan for proactively renewing the culture of success in your group. Learn about different personal styles and comfort zones so you can understand the diversity around you. Learn skills in group process to bring diverse styles and talents together into creative problem solving and creativity. 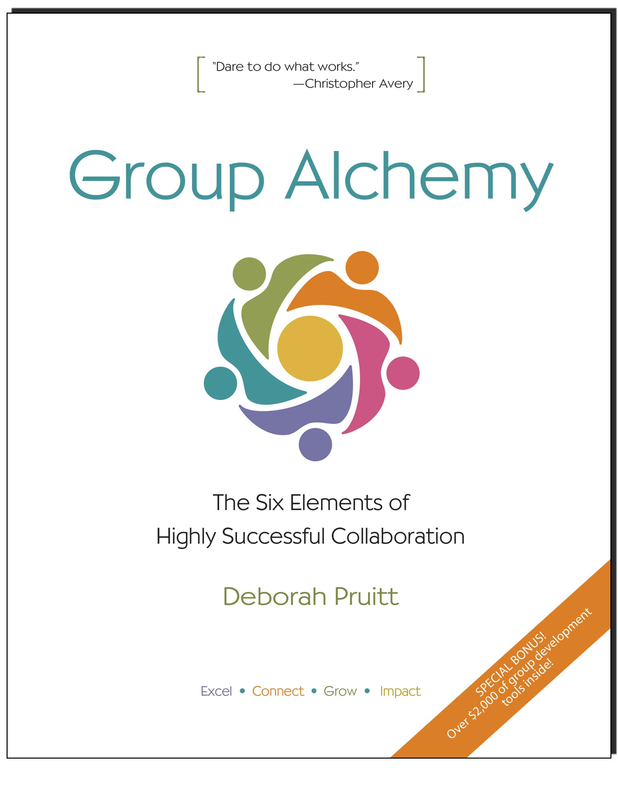 So there’s the six elements of group alchemy, proven by many groups to create big success and high personal fulfillment. And remember, you’ll have me walking you through these steps so you won’t be going it alone. You’ll have guidance and support all along the way. To recap, here’s what you’ll get with the Leadership for Alchemy Online Course. The full group alchemy formula in 4 live online classes. Each class will have a Q&A session – you get to ask any question you want about how to improve the performance of your team. Plus you’ll have worksheets in each module that take you through the skill-building steps in that element so you can become a change-agent. These are the same worksheets you can use with your group to bring them into higher-level collaboration. All the calls are recorded so you’ll get MP3 recordings of each class so you can listen anytime. Yes! I’m ready to Register Now! But that’s not all. You’ll also get these great bonuses. I know how much most people hate meetings. But I’m on a mission to change that because the simple fact is that meetings are a crucial part of groups that turn lead into gold. With the habits explained in this guide you can make meetings the Bedrock of Your Success – Not the Bane of Your Existence. This book gives you all the core principles and practices for each element and lots of examples to help you apply them to your group. You’ll have a handy reference for you for years to come.Because this is a process not an event. This is the great part. I’ve drawn on all my years of teaching and conducting workshops to create an online course that makes sure that you not only get your hands on this but that you actually USE it. You’ll be sent an invitation to join our exclusive online forum. There you’ll find the entire group alchemy steps laid out for you in a clear, easy-to-follow format. Each week you’ll join a 75-minute live call where I cover the principles and practices that you need to build your group’s habits in each element. You’ll have a chance to ask questions and explore just how this will apply in your group. You’ll have access to an online forum so you can join the learning community of like-minded progressive leaders and get their input too! There will be assignments each week from the workbook that will help you take these lessons into your life and make them real. Spring 2014 Dates: Monday, April 21st; Monday, April 28th; Monday, May 5; Monday, May 12th. So what is the investment for this program? Until now this full program has only been available when I work with a whole group which costs $18,000. But I want leaders like you to have a practical way to learn the principles and practices of group alchemy so that you can take them into your groups. So I created this online course to make it more accessible. This online course is normally available for $1,497. Yes, it’s a big discount – Because I want you to be able to take advantage of this NOW. It’s time to end the struggle and create bigger results. For this small investment of $597, you’re going to learn the secrets behind stepping out of the old-style management that just doesn’t work to build the kind of powerful group that continually produces excellence: in performance, profits and the impact you are able to make in the world. You’ll achieve more and enjoy the journey more. This is about having the satisfaction of a reliable formula to create the conditions for everyone around you to be at their best. Then together, you create extraordinary impact. This special offer of $597 will only last until April 15, 2014. After that time you can still register for the full price of $1,497 – still a GREAT value!! Yes, Deborah. I’m ready to get to gold in my group. I understand I’m going to get the Leadership for Alchemy Online Course where I’ll create the habits of collaboration in my group. Plus, I’ll get these bonuses. 1. Special Report. Alchemy for Meetings™: The Five Habits of Great Meetings. If you are in a business that requires a purchase order procedure, please contact us at info@groupalchemy.net. We want to work with you to make this happen for you.